In the age of social networks like Facebook, Twitter, and LinkedIn, it can be difficult for businesses to master the many intricacies of each new social network. Instagram, the photo and video-sharing platform of over 800 Million users, is no longer just a lifestyle-sharing app to show off your pet or favorite meal. In fact, businesses all over the world are taking advantage of Instagram’s popularity and marketing capabilities, accounting for 25 Million accounts. Instagram can be a valuable vehicle for your small business to market your offerings, grow your business, and interact with customers. If you have not already, make sure to convert your company’s Instagram profile to a business profile. Just as user-friendly as the personal accounts, business accounts link with your company’s Facebook business profile, allowing you to gain access to your analytics. Monitoring these metrics can give you insight into your followers’ demographics, what types of posts resonate most with your audience, and how many people are clicking your all-important call-to-action buttons. 2. Fill In Your Bio! You’d be surprised how many businesses neglect to fill out the most basic aspect of their Instagram profile: their bio and contact information! All users who end up on your profile might not know who you are, and this is your chance to let them know what you do and how to contact you. In 150 characters, convey what your business does by offering a short description of your brand and services. Next, provide a working email address, phone number, location address (if applicable), and the holy-grail—the link to your website! These call-to-action buttons provide an instant open line of communications between you and your leads. Like any form of marketing, consistency is key. Once you go through the trouble of setting up and posting to your Instagram profile, it’s important to post consistently and regularly. Users are choosing to follow your company’s account because they want to stay updated on the business. That being said, don’t inundate your followers’ feeds with posts, or you may come off as being spammy. Instagram users search keywords known as hashtags indicated by the pound sign (#). For example, a fashionista may be searching for fall fashion ideas with the hashtag #fallfashion. Utilizing hashtags is an easy way for your business to gain traffic from users who are out there looking for just what you have to offer. It’s important to use relevant hashtags that make sense with your post and brand. When drafting a post, Instagram conveniently gives businesses a preview of how many people are using a given hashtag. This allows you to select hashtags that are currently trending so your posts can have the greatest traffic. Instagram Stories emerged in 2016 as Instagram’s answer to Snapchat’s popularity. Instagram Stories allows you to string together multiple pictures and videos into a “story” that disappears after 24 hours. Because these posts are temporary, businesses might feel that trying to market themselves via Stories is futile, but that couldn’t be more wrong! Instagram Stories sits at the top of Instagram’s feed, so they are easily noticeable and clickable by users. Try using stories to give your customers a sneak peek at new products, giveaways, or sales, or offer a behind-the-scenes candid look at your company. Instagram is not just for still images. In fact, video content has been growing exponentially in popularity in the past year. Whether you’re sharing a polished commercial, animated marketing video, or an interview with your company’s CEO, video posts are a smart marketing tactic to catch the attention of any user aimlessly scrolling through their feed. In addition, Instagram has given users the ability to live stream. This allows businesses the opportunity to host a webinar or impromptu Q&A with their loyal followers. Take the time to recognize users that go out of their way to comment on your posts. These comments may be positive or negative, but it’s important to remember that everyone can see the comments section. Engage with followers so your followers know you’re not solely there to promote and sell, but listen to all customer feedback, too. If you’re posting regularly and not receiving much interaction, you may be just be posting at the wrong times! Generally, Instagram is most popular on Mondays and Thursdays, outside of working hours. That being said, each company has a different target audience they are trying to reach. Be mindful of your target audience’s location and time zone when scheduling your posts. Just because they’re your competitors does not mean you have to pretend their Instagram accounts do not exist. In fact, your competitor’s social media accounts can often be great learning tools for your own business in terms of inspiration and analyzation. What do you admire about your competitor’s profile that you could incorporate into your own? Do they have more followers than you? Do they appear to have better engagement? If so, what are they doing that you aren’t? If you can view their followers, take a look at their list of followers for a quick glance at their demographics. Is there an untapped market you haven’t considered yet? Using paid advertising on Instagram is an easy way for your business to increase traffic and engagement. Without advertising, only people following your account or searching your hashtags will see your photos and updates. By utilizing Instagram advertising, companies can promote their posts to capture their target audience. Similar to Facebook Ads, Instagram has many filters, so you can zero in on an ideal subset of customers. Playing around with your target audience’s location, interests, age, and gender, can help bring new markets to your business. Let’s be honest—users want to follow humans, not brands. Don’t be afraid to go outside of your company’s polished photos and post something a little more human. 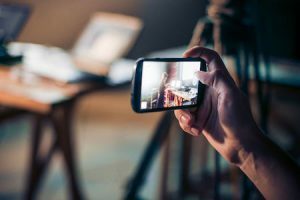 Offering candid “behind the scenes” shots via posts and Instagram Stories can help humanize your brand and connect on a more personal basis with followers. Try sharing behind the scenes stills from a photo shoot, a team photo from your latest company outing, or introduce the new employee you just hired—you’ll be surprised at the response! Don’t believe what you’ve heard—positive customer relationships can indeed be formed by sliding into your followers’ DMs. Messaging your followers directly allows for a private one-on-one conversation and lets them know that you care what they have to say. If a customer recently posted a positive product review on their profile, send them a direct message to let them know you are thankful. If a user left a negative comment on a recent post of yours, see how you can help. Direct messaging is also an efficient way to send promotions to loyal followers, such as a coupon code or offer unique to Instagram users. Some of the best advertising can come from your customers. For that reason, many businesses have found it successful to run a contest on their Instagram profile for the benefits of word-of-mouth advertising. Contests can be as involved or hands-off as possible, such as a contest with judges, or a sweepstakes. When in doubt, keep it simple: host a giveaway of your product or service and have users “enter” through following your account, tagging three of their friends in the comments of your post, and posting on their own feed. The increased engagement and activity will allow for your company’s name to spread and gain recognition. A quick way to gain brand visibility, influencer marketing is when you connect with popular users with an established following in order to get exposed to their audience. We’ve all seen A-list celebrities promote luxury brands on their Instagram posts, but how can influencer marketing relate to small businesses? Try utilizing niche marketing. Paying to have Kim Kardashian promote your company on her Instagram feed is out-of-the-budget and may not end up reaching your target audience. But what about a industry expert in your niche? For example, a cruelty-free make up start-up may partner with a vegan beauty blogger, whose followers align perfectly with their buyer personas. Exponentially cheaper than partnering with Kim Kardashian, the make up company saves money and gets their name into the minds of users who are more inclined to purchase their product. Instagram’s interface is ever evolving, and so is the interest of your followers. Don’t be afraid to break the mold and try out Instagram’s newest features as they drop, such as Instagram TV (IGTV). As we saw with Instagram Stories, sometimes the littlest update can gain big traction, and quickly too. By allowing your business the opportunity to experiment, you can catch a marketing trend well before your competition! Instagram is a great way to raise awareness about your organization and connect with new customers! As you can see, there are so many opportunities to promote your business on Instagram. Start experimenting today to figure out which of these strategies work best for your small business! Want to take your social media marketing to the next level? Set up a social media consultation with our social media experts! We’ll help you understand the opportunities you could be taking advantage of and point you in the right direction when it comes to getting started. Interested in marketing your small business more broadly? Connect with our digital marketing strategists to learn about other online opportunities for small business marketing! Give us a call today at 518-743-9424 or contact us online to get the conversation started!